You are here: Home / Announcements / Come feast on OZCF Broad Beans! Come feast on OZCF Broad Beans! Come one, come all – soon there will be beautiful green broad beans at the Oranjezicht City Farm’s market! These big green beauties (also known as fava beans) have been steadily reaching maturity in a multitude of staked rows in the city farm, a small, neat army of pale green soldiers standing to attention. Planted in early autumn, they have been nurtured from seed and are now ready to be harvested and enjoyed in a variety of luscious dishes. Imagine if you will, a light salad of briefly boiled beans with some cured ham (for “fava beans have a kinship with ham in all its forms”, argues the British cookery writer Nigel Slater). 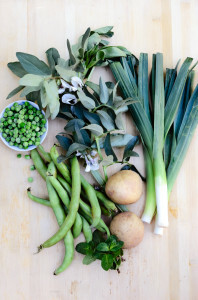 Or how about a simple dish of steamed beans, potatoes and artichokes (seasoned with garlic and a scattering of spring onions), as embraced by the writer Frances Mayes in her adopted home of Tuscany? But these are all the recipes of foreign cooks, you may ask – what’s cooking in our local kitchens? Well, that’s where things get interesting. Because next Saturday (9th of August) there will be a local and very lekker demonstration on how to cook with broad beans and our very own waterblommetjies, hosted by OZCF’s Making Kos collaborator Loubie Rusch. Titled Broad Beans and Blomme – Exploring a Few Ways to Use Them, this is the first in a series of planned cooking demonstrations to be hosted in the old barn at the farm. 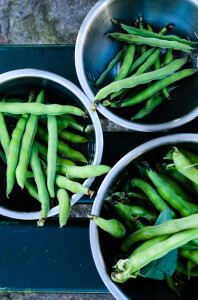 On the day, from 10:00 to 12:00, Loubie will harvest a range of broad bean pods as well as produce from the farm, and show participants how to make meals from these and other ingredients, with a particular focus on waterblommetjies. Locals will know that waterblommetjies (indigenous to South Africa, specifically the winter rainfall areas of the Cape) are now in season, to be enjoyed until spring. This delicacy, also known as Vleikos and Cape Pond Weed, has become so popular that it is being commercially cultivated. Although it is most often found cooked into the comforting winter stew Waterblommetjiebredie, there are a myriad other ways to enjoy and utilise this local green. 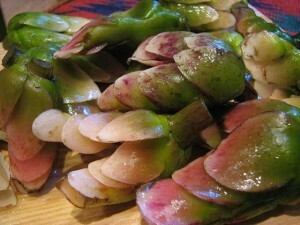 But back to the reason for this post: the broad beans are in season! And unless you intend to hand over a small fortune for a handful of lonely green beans at your local retailer, it’s best to come to the market to have a taste of the real (much fresher) thing – or of course to start growing your own. Because as we know, at the farm it all comes down to inspiring people to GYO (grow your own). – Sources: Jane’s Delicious Garden by Jane Griffiths, Tender: A cook and his vegetable patch, by Nigel Slater, and Bella Tuscany, by Frances Mayes.